Travellatvia is the biggest tourist internet portal in Latvia. It works since 2001. Daily we have about 2500 visitors. From them 30,6% are foreigners (from Europe – 13,5%, USA – 6,3%, Russia – 4,9%). Our target group are contemporary people about 30, who enjoy travelling and are everyday internet users. Our portal is available for Latvians, Russians, English and German readers. 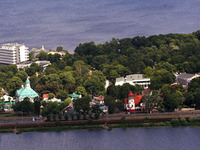 For English and German speaking people information about Latvia and travels inside Latvia is provided. For Latvian and Russian visitors we offer voyages to other countries. For all these visitors to make their choice easier (where, when and how to travel) we give an opportunity to use our services. In cooperation with travel agencies we inform about their products. We have our own database about country homes, castles, museums etc. in Latvia. TravelLatvia is the tourism catalogue not only for Latvia. Our portal is the widest catalogue about tourism and travel routes in Latvia and Baltic countries. Our purpose is to provide the travelling public with complete and reliable information, which can help them to select the best variant from wide range of choices. Therefore we would like to invite your attention to put your data into our catalogue. We can propose stable prices and individual approach. TravelLatvia ensures producing of professional articles and publishing on the site.